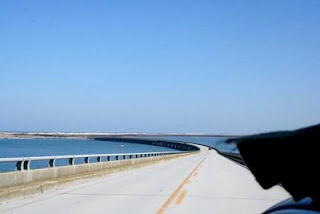 Chesapeake Bridge: The bridge, known as one of the seven modern wonders, connects Virginia's Eastern Shore with Virginia's mainland. I know that I already posted pictures of the bridge, but this is definitely one of the highlights of the road to the Cape. First morning in the campground. This is the KOA campground, which is located at about 20 miles from the Canadian Hole. Caesar (right) missed the storm for a few hours. Will he be the fastest sarilor in the East Coast this fall? 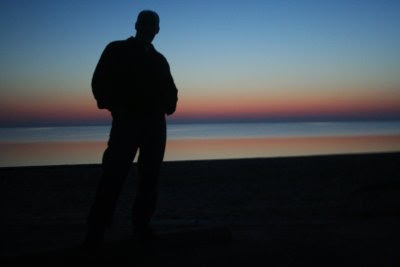 It's raining in Providence, and I am sitting in a Coffee Shop, with not much to do... As I was saying, Cape Hatteras had some wind for me and my friends, may be too much. Here are some pictures of that trip, which I think are more eloquent than me. May be in the future I will just show pictures, which is the ultimate purpose of this blog: to show you what I've seen, to take you where I've been. 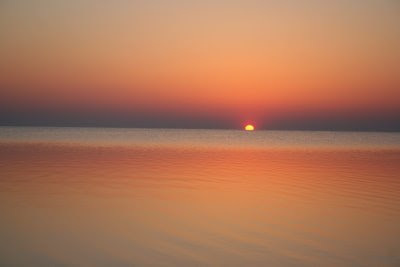 Cape Hatteras is a stripe of land that runs parallel to the coastal line of North Carolina. For years it's been a prime spot on the East coast, visited by speed addicts attracted by flat water, as well as wave riders and free stilers. 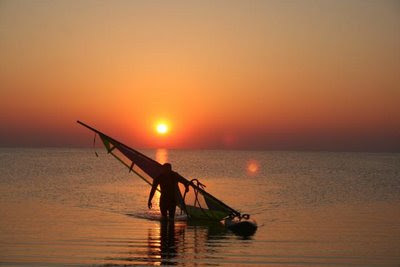 In March of 2007 I was living in Boston and windsurfing in Pleasure Bay and Cape Cod. My windsurfing buddy Sean Kelly was planning to go to Hatteras for a week to try his "new" quiver: a set of North Sails that he scored at some guy's basement for $ 100. 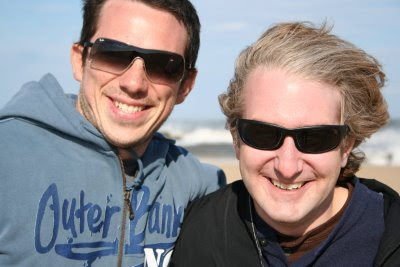 Needles is to say that by those days, necessity had pushed me and Sean to become experts in gear diggin'. On our way we picked up two more guys: Jordan, a musician friend of Sean's, and Jim, ex dirt biker with some of the scariest accident stories that I ever heard. Those days we were using Sean's Chevy Lumina for transportation; no roof rack (Sean's rack went flying in I-93, and a truck rolled over his Mistral Explosion, another treasure found in a backyard), just a blanket between the roof, the boards and the sails. This fine machine was a prodigy of aerodynamics, a compact bullet punching a hole on the road. Truck drivers would stay away from us, afraid that at any moment we would take off and go back to Mars. Probably the most remarkable feature of this veicle was a hard drive under the passenger's seat with 300 GB worth of Beach Boys recordings: the band's rehersals, the band on a plane trip, the band using the restrooms after a concert, Sean had it all. When I got out of the car in Avon, NC, I was certain that there is more to the Beach Boys than California Girls... Jordan in the picture, another big time fan of the BBoys. 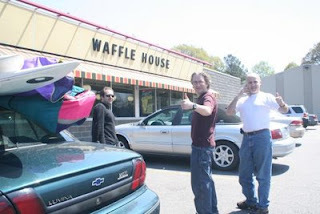 We found a Waffle House by next morning, after spending the night at a luxurious motel. The food was worth the wait. 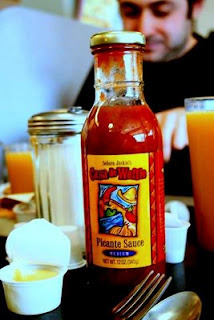 By then we were in the south, somewhere between New England and Mexico. Chesapeake Bridge: In the sunny morning of our second day on the road we went through this bridge. 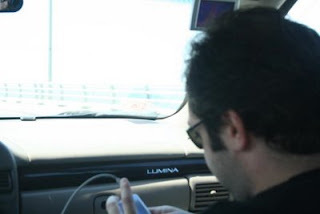 Definitely one of the highlights of our trip, 45 minutes of highway above the ocean, the idea that we would be windsurfing in that water in a few ours was unbearable... total silence in the car... well, silence and an interview to a guy that once went to a Beach Boys concert. 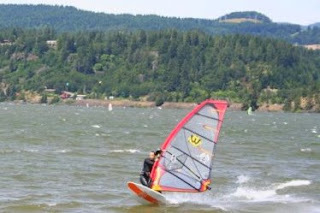 As I was saying in my previous post, my first day of windsurf was on a 93L Angulo Super Gu and Ezzy Wave sails 4.7 and 5.5, in the Event Site, probably the friendliest spot on the river. 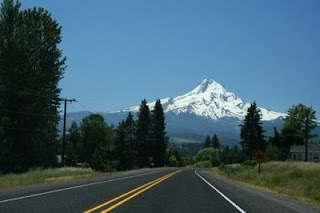 Then, no wind but still mind blowing scenery (Mount Hood in the picture). 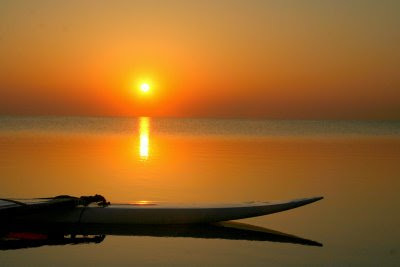 When the wind picked up, two days later, I was well rested, ready for more. This time the forecast was East ~20knts at Stevenson, probably the trickiest spot I've been to. Stevenson is a small town 15 minutes east from Hood River (by the way, for those of you who asked about the distances, all the locations I visited are within 20 minutes drive, very accessible by car). Stevenson is a good spot for E wind. This winter had a ton of snow, which means river currents of ~7 knts that will push you west, this is not a big deal with W winds, and actually is what creates the lovely ramps that we all like to crash our gear against. But on east winds things change. At the launch site in Stevenson the wind is stronger than in the middle of the river, which pushes us to think that it's a good idea to try that 75L board with that sweet 4.0 sail. When people get out, they face less wind than what they expected, that pushes them to make the second brilliant decision of the day, do a downwinder to get some speed and "recover" terrain once planing... well... that will never happen... what will happen is that once you decide to turn, you will realize that the current and the wind pushed you so far down wind that it will be impossible to go back. Plus, underpowered, waterstart becomes somewhat difficult... What's left is the most painful swim across the river, downstream. If you happen to be in the swimming olympic team, you might make it back, if not, you will end up in the middle of nowhere, exhausted and with post-traumatic stress disorder. I am the typical guy that runs into these inconveniences while traveling to remote places (I'm the kind of guy that thinks it will be easy to find an ATM, and if not, at least one open bank on a Saturday morning... in Morocco...) if it wasn't for the people at Windance that gave me the following TIPS TO SAIL STEVENSON (which surprisingly can also be applied to my beloved Fogland...): Use a floaty board. I used a Super Gu 112. I know you want to try that awesome Goya 60L, there will be time for it, relax, you are on vacation... Rig big. When I asked for a 6.0 at the shop the locals looked at me like I was asking for a spinnaker... They call 5.5 big stuff (I asked myself what would Igor think about this ;)... Anyway, they found a 6.0 for me, and I went to Stevenson with that rig. Conclusion: on marginal wind, be respectful of Stevenson. I don't mean to scare anyone, may be I am too prudent, and may be people will disagree with what I say, but this was my experience in ~18 knots. 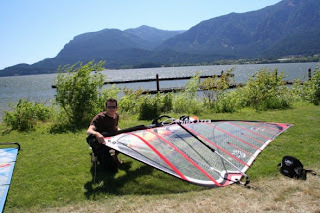 Again, this blog is meant for the intermediate windsurfer, who goes to the Gorge and wants to experience this mighty river... Robby, I have no good advice for you. 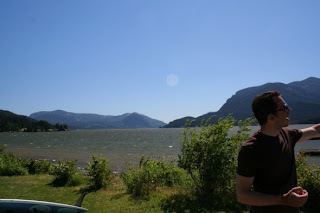 In the end of July of 2008 I did my first trip to the Columbia river Gorge, and this is what I saw. Airplanes: The trip started with a plane ticket Providence-Portland ($500) bought one week in advance. Getting to Portland on a multi-stop flight can be an adventure on its own. Anyway, this is my tip: avoid multiple connections: Providence, Charlotte, San Francisco, Portland is an example; the chances of getting delayed are huge, and you can waste on precious day. Car rental: I rented the basic car ($210 per week, Dollar). The car was a small car with no rack, they asked me if I wanted to upgrade, but I said no... then the lady at the desktop gave me a RAV4 for the same price. This might sound as a bad deal in times of G.W. and his quest for the highest gas prices ever, b ut for me it was a blessing. 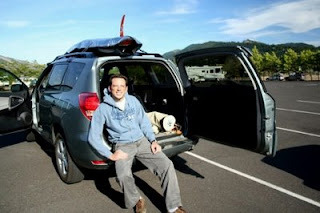 The RAV4 has plenty of space for 5 sails, 3 masts (inside), and a sweet rack for boards. not to mention the rest of the space in which my girlfriend managed to fit sleeping bags, tents, chairs, wood, cameras, and herself. So, tip: rent big, a few more bucks in gas will go a long way. The first day, my board was given by mistake to another guy, but Dave, the owner of Windance, provided me with a quiver for the day, AT NO COST... Board Angulo Super Gu 93L, Ezzy Wave sails and masts... So... TIP: call one day in advance to make sure that your stuff will be there, but don't panic, costumer care at Windance is excellent, and those guys will make sure that you windsurf every day possible. Day 2: Skunk! 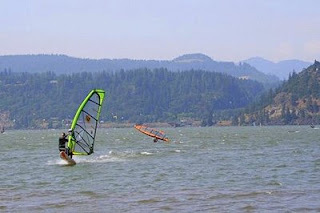 This can happen even in the Gorge, but you should not stress at all about it, since there are plenty of activ ities to do around the Gorge, from shopping compulsively at the windsurfing stores to hiking the numerous trails near Hood River. 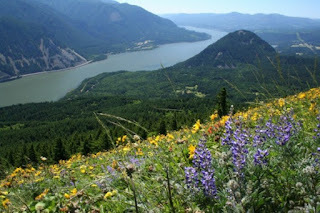 We choose Dog Mountain, a 5 mile stretch, which picture is shown below... mind blowing!! !